BG BritPOP still on top! A busy year was topped off in fine style with a 20 point win at the European IOM Championship for our BritPOP design and BG Sails. In fact BritPOP's won 4 of 5 seeding races, 9 of 13 A fleet races, had 5 in the top 10 and 10 in the top 20 overall. Not a bad effort against a quality field. Graham Elliott backed up his 3rd place in last years world championships at West Kirby with another fine 3rd placing, behind former world champion Zvonko Jelacic of Croatia. The event was held from drifting conditions in strong current to moderate B rig conditions early in the event once again showing our BritPOP to be the complete package. 2012 has definitely been a busy one for us at BG meeting demand for sails and fittings for BritPOP orders and those outside, along with the successful launch of our new Grunge RM. Our resources have been stretched thin at times and we thank our loyal customers for their patience through a house move and time away at international events. Our BG sails continue to win races at the highest level across the world with them now holding all international trophies across the IOM and RM classes held in recent years. Our sails have won national IOM championships in France, Canada, Spain and the UK where they placed 1st, 2nd, 4th & 5th. At regional level worldwide, our sails have also won events in Australia, USA, Norway, Sweden, Netherlands along with winning all UK IOM ranking races for the year. Our 3 BritPOP IOM licenced builders have been busy over the past 12 months with now over 85 boats in the water. At the European championships versions from all 3 builders (along with Graham Elliott's original BG prototype#2) featured in the top 20 places. Results which have backed our choice of trusted builders who can provide our design to customers that is true to our wishes and what we know works. We are mindful of some of your concerns with regards to extended lead times from our 3 builders though would like to hear of any design being offered to the same level of consistent performance and finish being produced in greater, or even similar numbers. As expected we have seen varying examples of BritPOP inspired designs show up all over the world, some good, some average. Some have gone further than just inspiration to pretty obvious measurements taken from hulls to sail panel layout and shaping, all seen and recorded at the recent Euros. More alarmingly though this trend looks to have spread to component, fitting and winch imitations showing a few to have little regard for the hard work of those who have supported our sport over a good many years as suppliers of quality equipment. At BG we are committed to only offering equipment (if not our own) sourced from suppliers known and experienced. If you are unsure about a "new to market item" please ask us as the word "proven" may not always hold true. The RM class enjoyed its first worlds since 2006 and congratulations must go to FFV (France) for stepping forward. The race was well supported Internationally and with strong talk of the next event being in NED 2014, this bodes well for the RM. Logistically the event was well organised but as with all events some things work well and some do not. I do see merits in a raised platform when conditions are perfectly suitable but from experience they usually create more problems than they solve. The slightest shift in wind direction has large effects on start line positioning that is fair for all to see. Then we have the situation of the "scrum" of skippers rushing and elbowing to one side in the hope of seeing a distant windward mark rounding which makes for scrappy racing. Umpiring was near non existent at times due to the difficulties associated with the vision problems. Many of the races in France could have been sailed from the upper elevated bank with skippers walking the beat for cleaner racing. We should be more flexible and not commit just to a platform. Measurement was strict in general with a 3 man team. As is standard now in France, competitors were fed a lunch meal each day on site which is a lesson on how things can be done at big events. A good week away socially. For me, 2012 was one devoted mostly to the RM class. I am hopeful now after the hard work and promotion of the class here in the UK by a number of skippers through offering loaned boats, wider media and nationals website promotion on the back of the first Worlds since 2006 will see the class kick on to levels once enjoyed. With an influx of IOM skippers looking for a higher performance experience in RM's, I hope we will look to adopt a ranking racing program similar to that of the IOM which is socially attractive for many and justifies the growing expense of distant travel. The IOM Europeans were held in Cres, Croatia which was not the easiest logistically to attend. A bus was organised at cost for the 7 of us to be picked up from Zagreb for the 2 hour drive, then ferry trip to the island. A nice setting. Deciding not to stay at the official hotel meant that we were denied opening and closing ceremony tickets which I felt was not in the spirit shown in most previous events. I feel when you enter for an event, some things should be inclusive with the opening and prize giving being foremost. Lunches are dependent on logistics, but usually at least should be offered as an additional extra option should there be nothing else on site. For some reason we decided to go back to an outdated umpiring system with observers being used as little more than secretaries for the early part of the event with a large amount of incidents being missed and a feeling of "have we learned nothing". Thankfully common sense prevailed "as it did in Marsaille 07" where observers were allowed to call contacts, putting the onus on skippers to correct themselves. Whilst no system is perfect, I felt that the IOM Euro '10 in Pierrelatte and IOM Worlds '11 were by far the best umpired where habitual offenders at the weather mark were penalized. We ended up close to this system at the end. Please, can we adopt the system for good and settle down to some clean racing :) Maybe even a list of radio sailing experienced umpires could be formulated? Measurement was "relaxed" with some basic rules not being complied with and seemingly overlooked. Unfortunately the PRO and his team had one of the most difficult weeks in dying unstable winds with tidal influence. What was most important is that they held their nerve consistently and gave us the best possible race in such conditions. Too often we see the race officer get nervous half way through an event and start to let go races that were canned earlier in the week under pressure to get enough races in. The number of races is irrelevant so long as the races we do score are quality races. Whilst this was a low races sailed event, the races were of quality so well done to the race management team. Racing was split between 2 course areas with one utilising a platform and the other offering a long walking control area, allowing fantastic longer courses. Non platform was the hands down winner again for cleaner proper racing. In the end we enjoyed our time away in our apartment. The town and people of Cres fed us well though it would now be interesting to see where our 310 EUR goes for an entry fee. If the hotel is a race sponsor, nightly prize draws are sponsored, food is not provided on any day or night as we are not hotel guests, then this can only leave logistical expenses of providing Umpires, Race management, Trophies and items such as PA systems, RIB hire, marker buoy's etc. Were we funding the 3 man video production team? Were we subsidizing competitor entries or accommodation in any way? As competitors I feel we have a right to see a breakdown on past event costs to better determine where our sport is heading. This will enable better formulated event guidelines as to what can be reasonably expected for your entry fee at future events. A good racing event that could have been better..
For 1 GBP we get 10 races every Saturday afternoon at Birkenhead against some of the worlds best. Looking forward to another good year of racing ahead both locally and abroad. A very big thank you to family and friends, suppliers and supporters. Now some 29 years, 14 boats, 1000's of hours of design, construction, development, evaluation and analysis later, we see the culmination of our BG designed and sailed "Grunge" winning the 2012 World Marblehead Championship in Ploermel, France. Making the win most memorable was the presence of RM class master and 4 time World Champion Graham Bantock in 2nd place, defending World Champion and big event skipper Martin Roberts in 3rd, with both pushed hard by 1990 World Champion and local favorite Christophe Boisnault. Our "Grunge" performed once again above our expectations in the light shifting conditions with its new untested swing A rig against a field of lighter displacement European designs that were expected to feature strongly. Through a slight speed advantage, a plan of banking consistent week long results without taking significant tactical risks of some others worked in our favor. The advantage was such that at times even after low risk less than favorable starts or poor tactical decisions, "Grunge" could come through for good scoring results on numerous occasions allowing her overall lead score to extend at each days end from day one over her nearest competitor. To say that both Victoria and I are thrilled would be a massive understatement. We do both know though that such a result can only be possible with the enormous support shown to us through friends, family and our loyal support base through BG Sails & Design. Thank you all so much! Our next event is the IOM European Championships in mid November where the quality of opposition will once again be World class. BG will once again be represented at this years show. Come along and see what new products and services we have for 2013 and chat with our team of Victoria, Darin Ballington and Greg King. All 3 have placed top 10 in UK IOM Ranking events and know our BG sails, designs and equipment inside out to answer any questions you may have. Our World Championship winning designs and sails will also be on display. BG is on the move! Come early August, we will be moving into our new premises nearby with larger workshop and sail making areas. We anticipate this move enabling us to increase production of our products and also further expand our business. Our phone contact and address details will be updated in due course with our email contacts remaining the same. We thank our loyal customers for their patience through our move. The weekend of June 23/24 has proven to be a memorable one for BG with a win at the Radio Marblehead Nationals on Fleetwood Lake. Our new "Grunge" design finally had an opportunity to race against world class opposition and has shown itself to more than hold its own. Racing over both days started with the lowest B2 Rigs in extreme conditions and ended with standard C rigs by the end of the event. To win with 15 points from 18 races was something only to be dreamed of against such quality opposition and is one that will be long remembered by us. At this moment we have no immediate plans for production, with our preference being to continue working hard on further improvements and mode optimization for a complete package capable of winning in all wind strengths. Much tougher challenges will certainly lie ahead for "Grunge" as we fear the "sleeping bear awakes after a poking". A pleasing result was also seeing John Tushingham sailing his borrowed Starkers design into 3rd place behind Graham Bantock. John's boat was using BG scrim sails made for its owner back in 2006! The event had the largest nationals entry for 10 years in the UK with 32 skippers which was great to see. With the Worlds coming up in France in October and future events in the pipeline, the Marblehead class is on the move Worldwide. Its business as usual at BG with orders steadily flowing out the door to parts of the globe far and wide. This last weekend has seen the premier UK IOM event on the calendar, the UK Nationals, where 73 skippers sailed in sometimes trying conditions at the Two Islands club, Milton Keynes. We saw 3 days of A rig conditions with constant large wind shifts and wind strengths from the lowest to the upper end of the rig range. Once again World Champion Peter Stollery showed his prowess with a BG Sails BritPOP to dominate the event from start to finish, mastering the conditions with ease. My own event was marred by some strange decision making at times and general poor sailing but to come away with a distant second place to Peter was satisfying very taking all into account. It was very pleasing to have a near dominant result with 5 of 6 BritPOP's in the top 10 overall with Darin, Tony and Greg having solid results throughout the weekend. For our BG Sails we had 6 boats in the top 10 so all in all a very good result for us continuing our success in the IOM class in fleets of the highest quality. News from our 3 BritPOP licensed builders have boats steadily moving to customers who we thank for their patience in waiting for the most recently successful IOM available. Next our attentions turn to the UK Radio Marblehead Nationals held at Fleetwood lake, the scene of the 2006 Worlds. The entry list will include not only current WC Martin Roberts (Starkers), but also the likes of Peter and Roger Stollery (Crazy Tube), Graham Bantock (Prime Number), Robert Walsh and Derek Priestly (both Starkers) amongst many others giving us a top quality fleet with most available noted designs old and new represented. The event website and entry list can be found here . My own "Grunge" now has a full compliment of completed rigs with time on the water and solid opposition the next requirement to start the tuning process. In following with the large interest return to the Marblehead class both in the UK and abroad we have also managed to acquire an immaculate older GB Paradox design for Victoria to enjoy some extra racing at club level and higher. With the Worlds in France later this year, things are hotting up in the RMs. Well it has been a while!! It has been a somewhat hectic start at BG for 2012. Demand for sails and rigging parts, coinciding with new BritPOPs hitting the water from our 3 licensed builders has seen our output levels stretched a little further than anticipated. As a result we have had to restrict new sail orders to the IOM class to best work through the large list of orders on file. Once again we would ask that if wishing to place a new sail order with us that you contact us well in advance of any event or build you require your sails for. Our new 'Grunge' Marblehead design was launched in late March after a delayed build time stretching back to early July 2011. 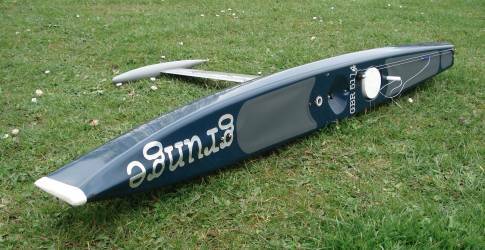 Its first full race against world class opposition will be the upcoming UK Nationals in June at Fleetwood with further races being used to have the boat ready for the RM Worlds in France in October. The design is a progression on from our previous RM designs, incorporating some valuable lessons learned from our successful BritPOP IOM. Rigs will be swing for the A rig with shroudless conventional for the lower suits, incorporating pocket luff mainsails manufactured by us to a design by Graham Bantock/SAILSetc under agreement. As with our BritPOP and previous designs though, you will not find any wild claims of superior design or breakthrough without having shown itself against world class opposition. To do so would be both irresponsible, misleading and unrealistic web talk. In closing a reminder that this is the only place you will find our own BG products we use to success. A personalized service with the experience and support to stand behind what we offer to the marketplace. Since our last updates, our BG sails have continued to perform strongly across the globe at all levels of competition.